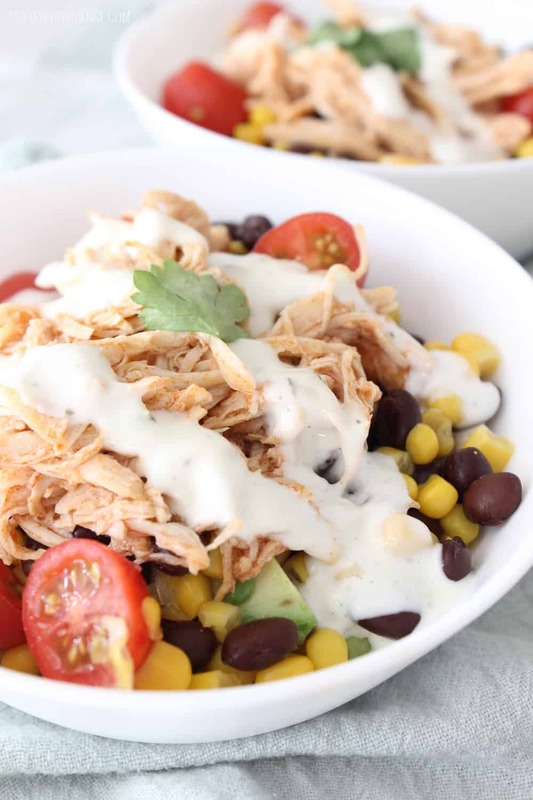 Healthy bowl recipes are my go to lately and these healthy buffalo chicken bowls cannot be beat! 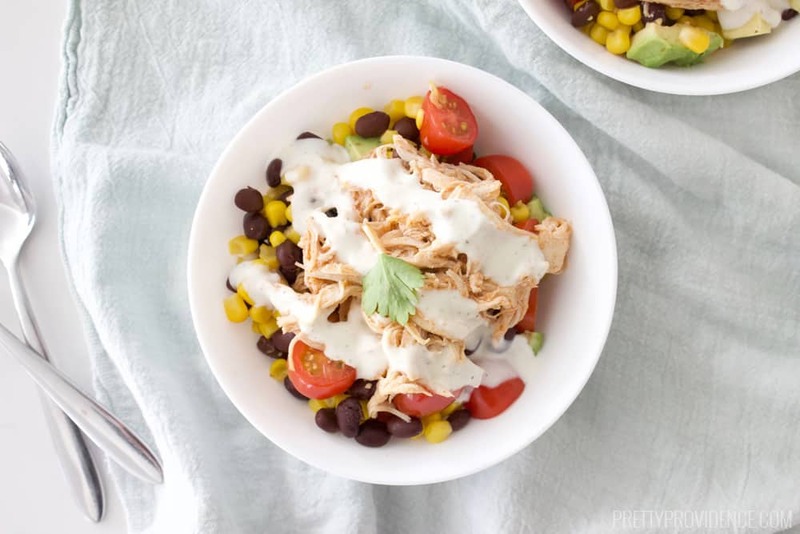 If you love healthy bowl recipes then you will love these buffalo chicken bowls! Made with tons of veggies, shredded buffalo chicken, avocados and a light ranch dressing they are filling and delicious! So ever since baby number three came around (about six weeks ago) I’ve been trying really hard to be more healthy. I hate dieting, counting calories etc. (who likes it?) So I’ve been working on just changing my lifestyle to a healthy, happy, state that I can maintain. A huge aspect of making healthy eating maintainable for me is that food still has to be filling and taste good! 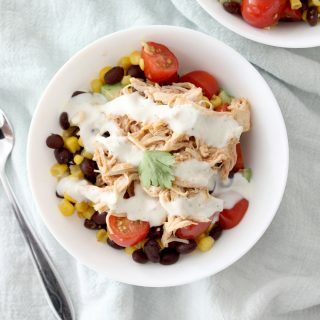 These shredded buffalo chicken bowls manage both of those things, with flair! My sister gave me the recipe, and I have eaten them at least twice a week ever since.. guilt free! 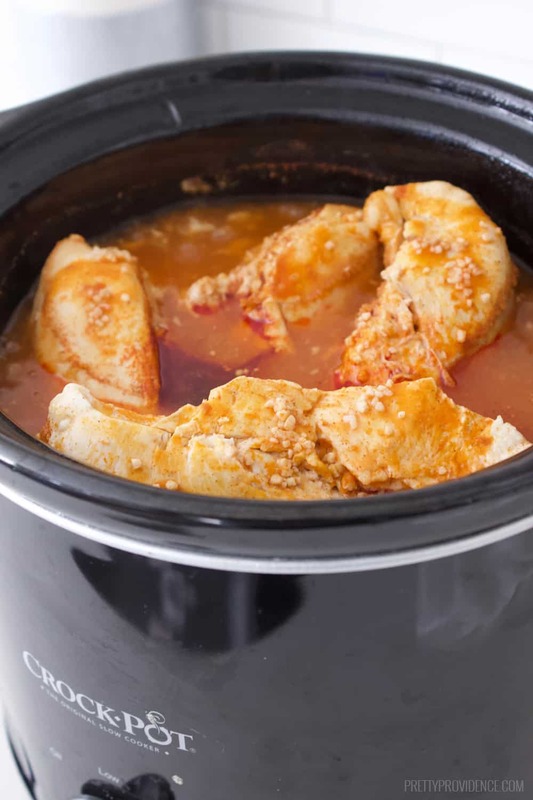 This healthy crockpot buffalo chicken isn’t only delicious in this healthy bowl recipe! We love to eat our leftover shredded buffalo chicken on salads, sandwiches or tacos as well. One of the best things about this recipe is that most all the carbs come from veggies! There is no rice or noodle base and guess what– you won’t even miss it! 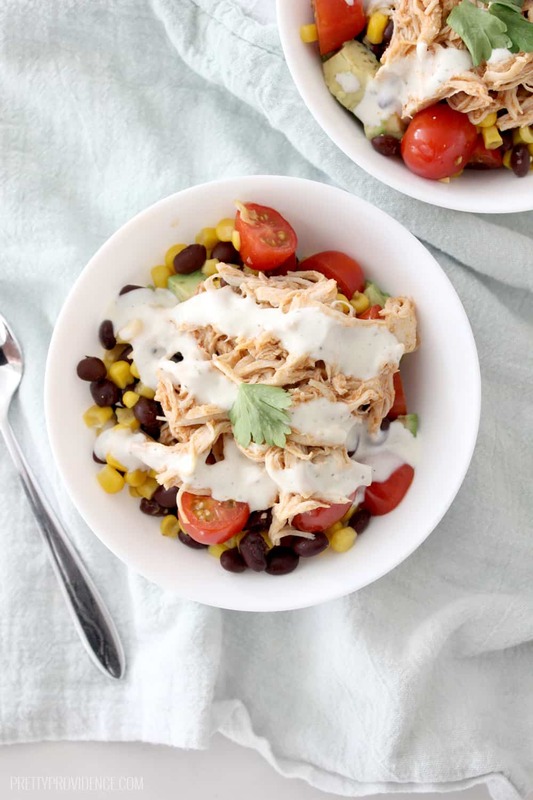 There’s a reason these healthy buffalo chicken bowls are one of our very most popular recipes and that’s because they are filling, healthy, and delicious! Healthy bowl recipes are my go to lately and these healthy buffalo chicken bowls cannot be beat! Even my kids love them, and they are totally guilt free! 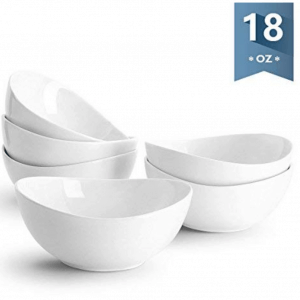 Assemble your bowls by adding your veggie mixture, topping with chicken, and finishing them off with some healthy Greek yogurt ranch dressing (or whatever your favorite ranch dressing is). 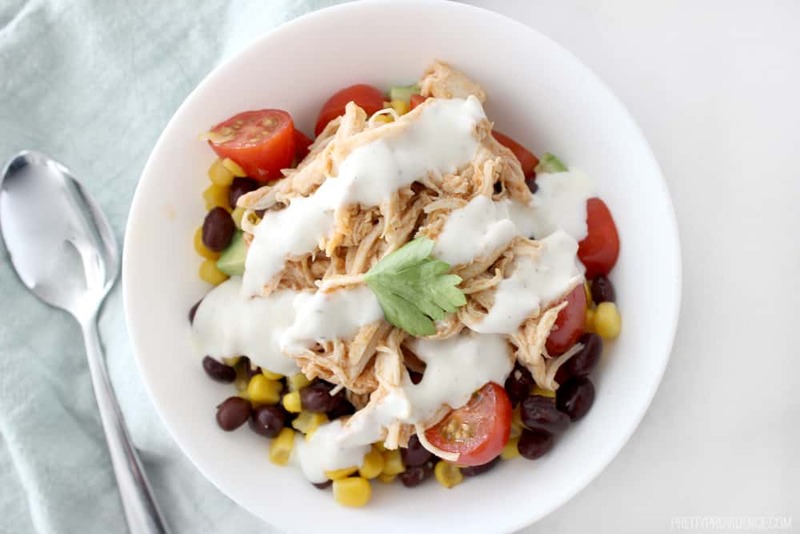 If you love this healthy buffalo chicken bowl recipe and want to try another of our popular healthy bowl recipes be sure to try our healthy greek chicken bowls or our Special K Breakfast bowls! Mmm, my mouth is watering just looking at the pictures! There are so many delicious flavors in this buffalo chicken recipe, I guarantee it will leave your tummy not only full.. but happy! Well, there you have it! I hope your family loves this dish as much as mine does! I added some pepper and celery with a few blue cheese crumbles. Added a couple of WW points but it was delicious. I just got a rotisserie chicken. Is there a way I can make the chicken for the dish with that and the hot sauce without cooking in the slow cooker? Thanks! Yes! Just toss the rotisserie chicken with some buffalo sauce – it works great that way! Oh my goodness these sound amazing! Muat try when holiday comes !! I can’t find the Hidden Valley Greek Yogurt Seasoning anywhere. What can I substitute for it? I have used the regular ranch seasoning packets and it is delicious! Great recipe! Used some precooked shredded chicken breast, reheated with Buffalo Sauce. Fast, easy, tasty and healthy, what more could you ask for? Just found what we’re having for dinner tonight. Hi – can you let me know how many pounds of chicken? Since chicken breasts can vary widely in size, I am struggling to figure out how many of my “chicken with rib meat” breasts to use. Thanks! About 2 lbs! But if its a little more or a little less than that it shouldn’t matter! Good luck! I’ve never thought of freezing it that way. That’s SMART. Thanks for sharing! So much goodness in these bowls! LOVE!!! I love everything in this!! I always keep these ingredients handy for yummy dishes like this & it’s so filling! Yes, that’s the best part! Thanks so much Kristyn! Easy healthy dinner recipes, we loved it! Yay! That is so fun to hear! Thank you so much! These are our favorite bowls! Packed full of goodness! Ours too!! Thank you so much! 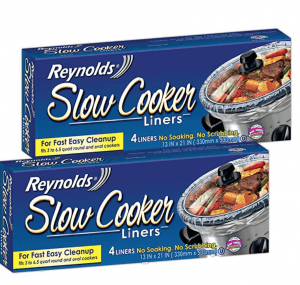 perfect for last nights leftover chicken!! I have everything I need to make this for lunch! Looks really tasty, for sure going to try this! The buffalo sauce has a little kick but the ranch kinda mellows it out so it’s definitely not too bad! My kids eat it! 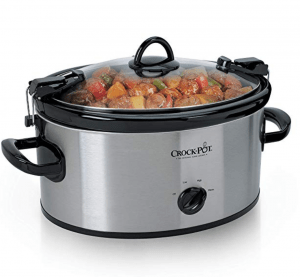 Can the chicken be frozen in the crock pot? Or should it be thawed? So fresh and easy to make. Loved it and Its nice and healthy. Adding to my recipe book! So savory and freSh. Delish! I love easy, healthy meals like this! I need to try it soon! These bowls are incredible! They are now on my weekly dinner rotation, and arent leaving ever. DELISH! Yay! So glad you love them! We eat them ALL the time too! I could eat this every night! Delicious! these are so yummy and so easy! Thanks for sharing! I saw in the video it showed 3 chicken breast but in the recipe it says 6? Which is correct? In the video we halved the recipe to show it easier, i’m so sorry for the confusion! 252 calories per serving which is how much? about 2-3 cups or so? Do you have a nutrition fact chart available for this recipe? Would help me a lot, thanks! I don’t yet but we are working on a new recipe plug in that will have one, so hopefully soon! Thanks for the feedback! So do you eat these cold? The chicken is warm but the rest is room temperature! For leftovers I sometimes eat them cold and they are good either way! Would this stil be good to cook a big batch and freeze it. Then thaw, reheat and eat? You could absolutely cook a big batch of the chicken and freeze! I proabably wouldn’t freeze and thaw those veggies though! I have NEVER been a big Chicken person, but I Love avocados & cherry Tomatoes… I cooked this tonight and my husband LOVED it… So I gave it a try and WOW I am hooked. I love that it is filling but also healthy…Thanks so much!!! Aw! Your comment just made my night! I am so glad you liked it! Finding great healthy meals really is so hard! Thanks for taking the time to come back and let me know you loved it as much as I do! ???? Oh my gosh yum!!! Making this ASAP! So how do you make the dressing? Ad d the packet, the milk, and the yogurt? Or do you make the dressing using the directions on the back of the packets, then add milk, and then yogurt?? you just add the packet, milk, and yogurt and mix and then you’re done! This looks so good and easy. I even think my hubby would like it with a couple of changes. He only like thousand island dressing and hates avocado. Any suggestions on substitutions while staying healthy? You could totally just leave out the avocado and have everyone dress their own! These babies are super adaptable so it should be easy to make sure everyone is happy! Good luck! Do you eat it cold or hot? The chicken is hot but the rest is kinda just room temperature! The truth is its good either way! How would you allocate this recipe to the 21 day fix containers? 1 Red, 1 green, 1 blue? I’m new at this so your advice would be greatly appreciated! This is my amateur opinion, but unfortunately, both beans and corn count as a carb, so it would be at least 1 yellow too. 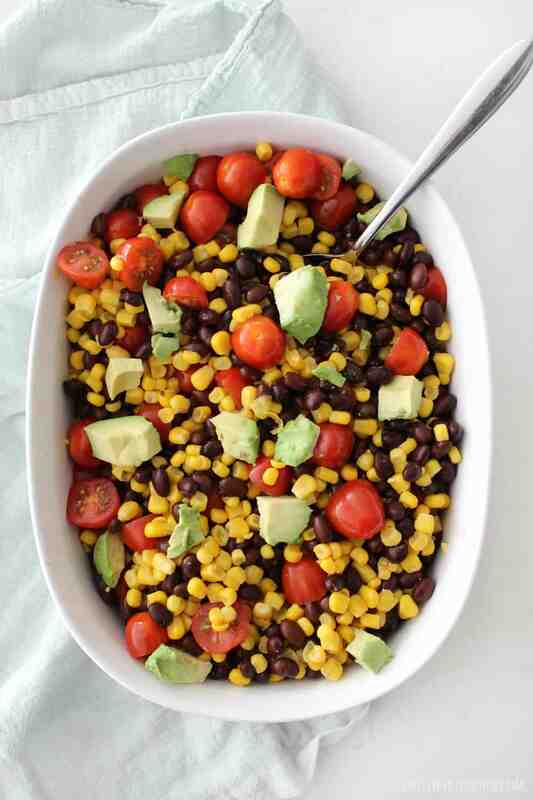 You could probably back off a bit on the corn and black beans by putting all of this over lettuce and then that would get you another green. Dressing is usually an orange, but since this uses Greek yogurt, which is a red, you can probably just include it with the red from the chicken, as long as you use it sparingly. I would portion all of these ingredients out in your containers and you should have a tasty meal! That’s what I was thinking. Not too much beans and corn. More lettuce instead. Love that it’s greek yoghurt! I think it will be both delicious and 21 day fix approved with a few modifications… Can’t wait to try it! Does anyone know how many weight watchers points this would be? Need to know calories per serving, along with fat, carbs, protein, and fiber. You can add all the ingredients to the app (basically “build” the recipe) ad it will tell you the points! I am always looking for healthy lunch ideas and this looks so good! I really want to make it but am a little nervous about cooking the chicken in just hot sauce in the slow cooker. I just want to make sure there is no other liquid needed and that it won’t burn? No it won’t burn, promise! I have made this loads of times without any problem! Just try to make sure the chicken is all coated and you could stir a couple times to make sure the same edges are t touching the sides to be extra safe.. But I’ve never had any issues! Good luck! Oh my goodness these sound amazing!! You had me at “buffalo”…and the healthy part is a total bonus! Yay! I’m so glad you’re excited, thanks for your comment ???? This sounds fantastic!! Excited to try this – thanks for sharing your recipe! Yum, this looks delicious! Must try! I’m trying to eat healthier too and these bowls look delicious!! I also love that you put ranch on it! I love buffalo sauce but can’t stand bleu cheese…ranch is the only way to go!! This looks wonderful and so healthy too! I’m adding it to my list of dinner ideas. Would be great for my lunches too! Yes! Lots of times I use it for a quick lunch, without the chicken, if I’m in a hurry!